Ogden, UT—August 3, 2018 —MarketStar, the industry leader in outsourced sales and marketing, today announced it is publishing a guide detailing the benefits of an AOR selling approach. 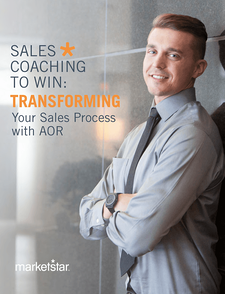 The e-book, Sales Coaching to Win: Transforming Your Sales Process with AOR, is available for free download at www.marketstar.com/sales-coaching-to-win-transforming-your-sales-process-with-aor. To learn more about this e-book or MarketStar’s innovative solutions, visit www.marketstar.com. MarketStar is the industry leader in outsourced retail, partner, and direct sales motions for the world's leading and emerging companies. MarketStar engages consumers, channel partners, and business-to-business buyers to increase sales by deploying field and inside sales teams, enabled by best-in-class technology and insights. MarketStar is a part of the DAS Group of Companies. For more information, visit www.marketstar.com. Search MarketStar's website to find exactly what you need to accelerate your sales!